Betsy Lewis, Emmy Brown and Emily Richards walked down Butler Street amid sun-showers and humidity Saturday afternoon. As rising juniors at Pitt majoring in microbiology, neuroscience and physics, respectively, they ventured out of Oakland to admire local art displayed along the sidewalks of Lawrenceville during the neighborhood’s first art crawl. The Lawrenceville Art Crawl looks to celebrate the neighborhood’s energy and vibrant community with an event spanning from the 40th to 52nd blocks of Butler Street, the business district’s main drag. Presented by local art collective Redfishbowl, this year’s event featured more than 150 artists, 15 bands and 25 venues offering free or low-priced entertainment, art and food to visitors to the hipster-chic business strip. Lawrenceville stretches from the eastern edge of the Strip District along the Allegheny River, and sits next to the Allegheny County Cemetery — one of the largest and oldest cemetery sites in the nation. The town began as a small trading post for English and French settlers in the 1700s, and in 1814 William Foster, father to the now-controversial composer Stephen Foster, laid out the city. Lawrenceville became an official borough of Pittsburgh in 1834. Nicknamed the “cradle of American industry,” Lawrenceville soon became the home to German and Irish immigrants who worked in the neighborhood’s many mills, breweries, glass factories and steel manufacturing plants. In the early 20th century, Poles, Italians, Swedes, Croatians, Russians, Lithuanians, Slovenes and African Americans all settled in Lawrenceville, forming a diverse community of laborers and artisans. Today, it is a growing village of small business owners and Pittsburgh-based artists, a community that prides itself on its rich history and unique mix of old architecture and new construction. “The goal [of the art crawl] is to invite the community to come out and appreciate the vibrant culture and innate talent that Pittsburgh has to offer,” the art crawl’s Facebook event read. More than 5,000 people marked themselves “interested” on Facebook, including Richards, a Pitt student who first learned about the event on social media. “Local artists don’t always get much of a platform, so it’s nice to see them doing their thing,” she said. For local tattoo artist Christan Miller, owner of Eclipse Tattoo in Springdale, events like the art crawl are not only fun, but necessary for her business. By sitting outside the Ravenwood Collective with a display table full of her work, she could educate passersby about her craft and talk to members of the Pittsburgh community. 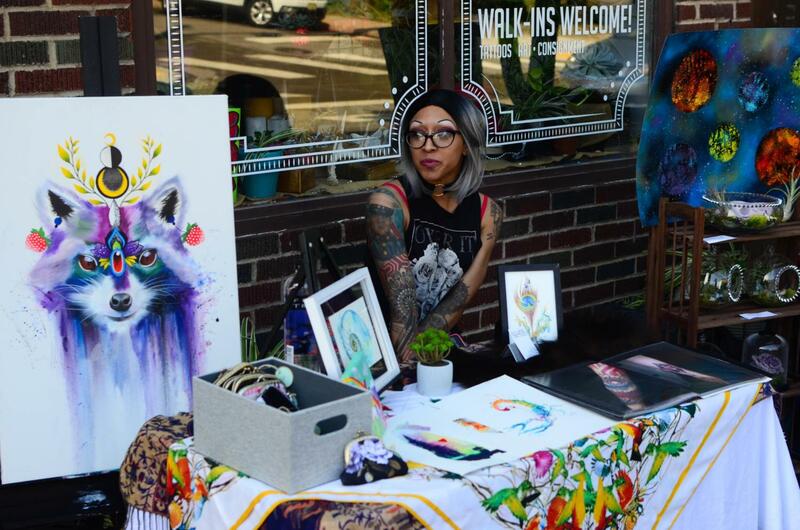 Miller specializes in watercolor tattoos, and she said the art crawl is important for artists like her because it helps them grow their network and meet potential customers who may not know about their craft. Artist Gwen Schmidt specializes in acrylic paint and design, and echoed a similar sentiment while stationed under a canopy in the WWI Memorial Park next to the Boys & Girls Club. Butler Street is one of Lawrenceville’s busiest streets, where music, food and drink regularly light up the night for visitors. Live music drifted through the air as guests ventured further along, passing pop-up tents and live art demonstrations. Crowds gathered at Beer on Butler to eat at the My Dogz “On the Run” food truck and celebrate Pop Thief’s album release. Spirit, a two-floor music venue and cocktail lounge just off of 51st Street, was another popular destination for the art crawl. Local jewelry makers and ceramic artists sat in the venue’s outside lawn area to sell their handcrafted goods. Inside Spirit, graphic designer and illustrator Trenita Finney handed out free prints of her work, as well as coupons for 20 percent off art commissions. Intricate pendants, hand-blown water pipes and small glass turtles sat on the table of Saxonburg-based glass artist Sean McDonald, owner of the Jefferson Glass Company. Pitt’s very own Jack Stauber played a short set at Spirit after performing his first show of the art crawl at Roundabout Brewery, performing a mix of album tracks and improvisational, live-only fan favorites. And for when the crowds got hungry, food trucks parked along the Art Crawl route and sold hot dogs, pierogies, pickles on a stick and ice cream to hungry guests. Lawrenceville is also home to a broad range of restaurants, with the Mediterranean-American fusion all-vegan B52 Cafe, The Vandal, a cheery, modern take on Eastern European cuisine and New Amsterdam, which features microbrews, bar bites and a rooftop patio. For tourists and Pittsburghers alike who have never explored Lawrenceville, the art crawl was a perfect sampling of all the town has to offer. Finishing up their rolled ice cream, Lewis, Brown and Richards spotted a small crowd gathered around the Level Up Studios dance crew beside the Boys & Girls Club on Butler Street. They stopped to watch the group dance to hip-hop beats blasting from a wireless speaker. After their routine finished, Brown looked to her friends.